Pikachu, Charmander, Bunnelby and the list goes on. These names were alien to me just a year ago and now I hear them non stop as Lil A debates their power, damage and strengths. In case you were wondering, they are all Pokemon characters and Lil A is into collecting Pokemon cards. It all started last summer when a couple of his older friends gave him a few Pokemon cards and he was hooked. Slowly he figured out the trading part. He was so excited when he got his first EX card. Yes, it is supposed to be a big deal! 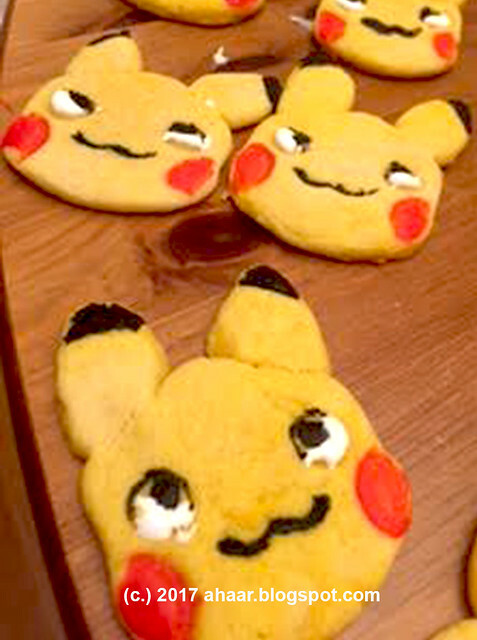 So when his birthday rolled by, I decided to surprise him with some Pokemon cookies. I ordered a few Pokemon cutters and got to work. As this was a school treat, I decided to minimize glazing. 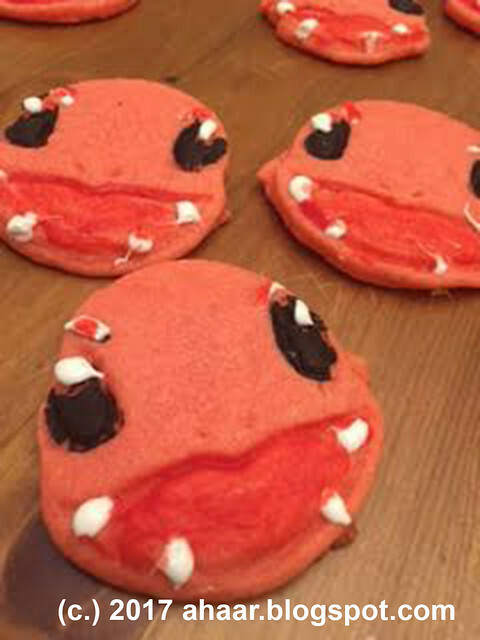 I put some food color in the cookie dough and just colored the eyes and mouth with sugar and food color mix. It made the impact I was hoping it would make. Lil A was all excited and he and his friends enjoyed the treats. Here is a small trick I learned with this cookie. For best results, refrigerate the dough before putting it in the oven as well. It's been a while since I have been here. When things get busy with illnesses or some difficulty, I tend to draw in and focus my energy on getting through it. You know how it goes, right. With two little kids, it is kind of inevitable. Everything is fine now and I am coming back gingerly, having been away for so long. Hope you had a good holiday season. 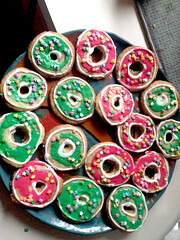 I had a couple of cookie exchange and here is what I made for one of them - wreath cookies. Regular sugar cookies. Tiny M and I had a lot of fun making it. He was very interested in helping me, carrying them to the tray, and occasionally tasting little cookies that came from the donut holes of the cookies. I set aside some cookies for them and they colored their own. When I was at the Farmer's Market last month, I picked some lamb shoulders with nice marbling. The next day a couple of foodie friends were coming for dinner and I knew I had to make something special with it. I settled on lamb rogan josh without knowing it was one of their favorite dishes. I got the recipe off the web from one of the blogs. The recipe called for 3 tbspoon of kashimiri chilli powder. I am usually cautious and will taste, but for some reason I forgot to this time. So when it was time to taste, I almost choked. The heat was too much, overshadowing the taste of other spices. I decided to throw out the entire curry and start all over again. This time settling on a much lesser amount of the chili powder. Maybe our tastes are milder, maybe the kashmiri chili powder I had was too spicy, or maybe both. I will never know. But now I have a recipe that works well. This recipe has no onion, or garlic. The flavors come from the black cardamom, dry ginger, fennel and asafetida (hing). Use ghee for best flavors. 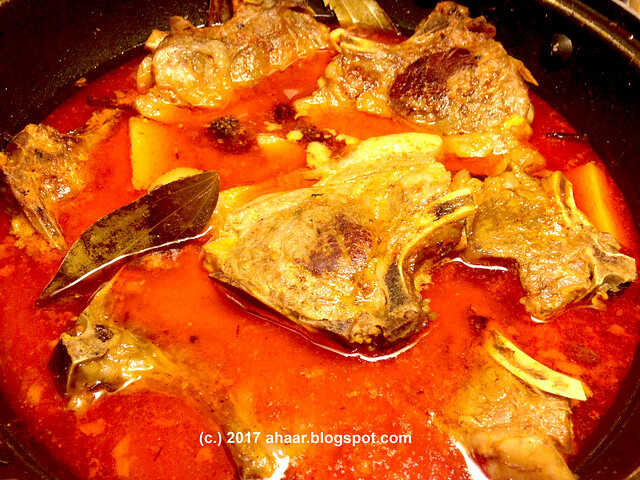 If it feels too much, temper in ghee and use oil for the rest. The second version came out great and it turned out to be a great evening.